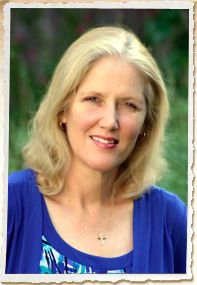 Kelly Irvin is the author of the Bliss Creek Amish series and is currently working on The New Hope Amish series. 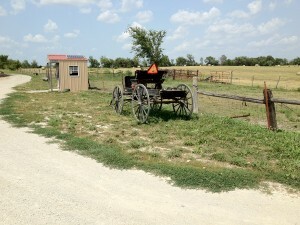 Kelly is a Kansas native and has been writing professionally for 30 years. She and her husband, Tim, make their home in Texas. They have two children, three cats, and a tankful of fish. A public relations professional, Kelly is also the author of two romantic suspense novels and writes short stories in her spare time. To learn more about her work, visit www.kellyirvin.com. The way the young girl dangled her bare foot over the side of the two-seater as she drove through town at a quick clip. The two little girls using brooms taller than they were to sweep the porch. The phone shack with solar panels. The little boy tugging at the reins as he walks the Shetland pony around in a circle, a young buggy driver in training, no doubt dreaming of that big moment when he actually hitches his horse to the buggy. The couple driving their buggy out to the phone shack by the road instead of walking. The sign that read No Hitching Here and featured a graphic of a buggy instead of a car. 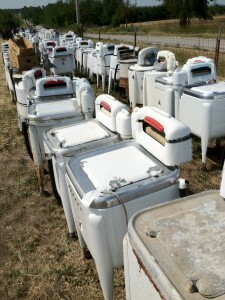 The endless row of wringer wash machines at the auction, all white, except one pink one. 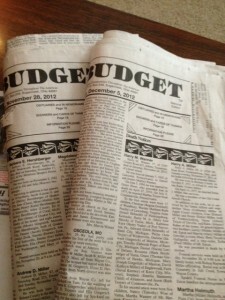 I love to read The Budget newspaper. For those of you who don’t know, it’s a national publication full of articles written by Amish “scribes” from all across the country. It is national, but yet it feels like a community newspaper, full of the bits and pieces of news that the writers would share in letters to family members. It’s as if they are writing to family. The Budget reminds me of the little daily newspaper in my hometown of Abilene, Kansas. When I was growing up, my dad would sit in his easy chair in the living room and peruse the pages, looking to see who died, who had a baby, who got married, who graduated, who got baptized, and who spent the night in the county jail. The Reflector Chronicle told the tale of a small town where everyone knew everyone and wanted to know how they were doing. It’s so different from the news now, which is fast and furious and focused on the negative—so much so that we may begin to think that if it weren’t for bad news, there’d be no news at all. They sprinkle their stories with proverbs like “If you want to feel rich, just count all the things money can’t buy,” or “Don’t be like the wheelbarrow which goes no farther than it is pushed.” Do you ever feel like that? I know I do. Last summer my husband and I attended an Amish school fund-raiser auction in Jamesport, Missouri. The auction was a beehive of activity of all kinds. Three auctioneers yelling at the same time. People from all over the state wandering through rows and rows of farm equipment, furniture, and dishes and pots and pans. 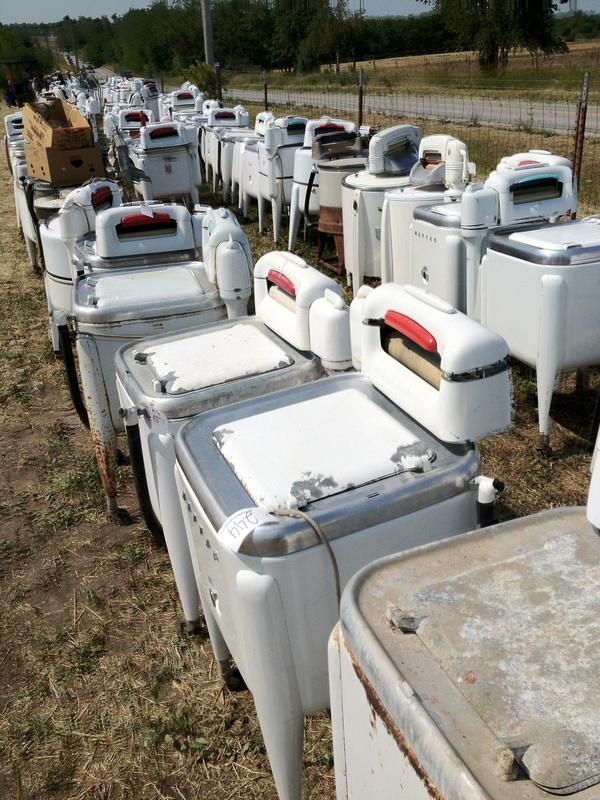 The items that caught my attention immediately were the wringer wash machines–hundreds of them. They were mostly used, but some looked brand new. I knew many Amish families use wringer wash machines that have been retrofitted to run on propane, but I’d not really given any thought to what that means. It makes the job of doing laundry for families that typically have seven or eight or more children easier because they don’t have to wash them by hand. 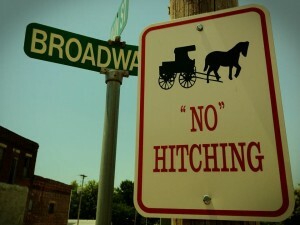 However, it’s certainly not easier by English (non-Amish) standards. If you’ve ever done laundry with a wringer wash machine, you know it’s not easy, compared to using a modern day wash machine with a spin cycle. I know because as a youngster it was my job to do laundry for our family of seven. We had a wringer wash machine and no dryer. So a typical laundry day involved gathering the laundry on the covered back porch, sorting it, running a hose to the wash machine to fill it, and then filling two large sinks with cold water. I ran the clothes, piece by piece, through the wringer into the rinse water in the first sink, ran them through the wringer again into the second tub for another rinse, and then wrung them out a third time into a basket. From there it was on to the backyard to hang them on the clothesline. As you can imagine, this was a long, tedious, job. I never thought much about it, though. We’d always done it that way. The time a huge, black, hairy spider leaped from the clothes basket into the sudsy water, riding the waves into I wacked him out with a newspaper—that stands out in my mind. The clean smell of the soap and bleach still lingers in my memory and the pleasant, steady, swish, swish of the water being agitated in the machine—those memories still surface when I smell clothes soap even now. 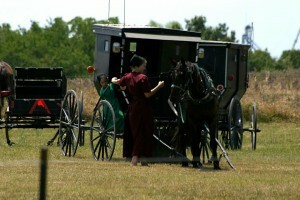 As I write my Amish romances, I imagine the young Plain women doing the same thing. Inhaling the scent of clean and knowing they’re taking good care of their families. The decision to use a wringer wash machine by some Amish communities would not be a decision made lightly. They don’t shy away from hard work and they’re thoughtful about embracing modern day conveniences that might lead them astray from their commitment to keep themselves apart from the world. They don’t have to do it the easy way. They see a value in being tired at the end of the day because they’ve worked hard. Their way of life certainly helps me keep in perspective the concept of hard work. It’s good for the soul and the body. A long row of wringer wash machines at the Jamesport Amish school fund-raiser.